The conference was attended by 1700 participants among which included; university students, university faculty members and Global Health experts from 50 nations. The conference had 18 satellite sessions, plenary sessions, debates, oral presentations, poster and panel sessions on varying topics. Patty Garcia, former Minister of Health from Peru gave a passionate key note address on Corruption and Global Health, confronting the world’s history on corruption and its impact on health highlighting examples from Peru. She also mentioned that it could be the defining moment between life and death and that corruption is an elephant which is an underlying factor to poor health outcomes that is not talked about. An intriguing debate was held on “The fields of Global Health prioritizing existing threats, including climate change and environmental degradation, over more proximate health concerns.’’ Presenters noted the fact that whereas these are important aspects of the Sustainable Development Goals, one needs to look at each with its own dangers and each of them believed that if their motion was not looked at critically, it could wipe out humanity. Screenshot 2019-03-1120AHAIC2019 5-7 March Kigali Rwanda1With over 1,500 delegates and 60 partners from 47 countries, Africa Health Agenda International Conference (AHAIC) was a conference for Africans in Africa. The African Centre for Global Health and Social Transformation (ACHEST) participated in the AHAIC 2019 Conference in Kigali, Rwanda organized by Amref Health Africa and Rwandas’ Ministry of Health from 5-7 March 2019. Professor Philip Cotton, the Vice Chancellor of the University of Rwanda got the conference off to a great start on the first day of the AHAIC with a provocative pre-plenary special lecture on morality and health. He literally climbed over chairs in the plenary hall to demonstrate that "nothing must stand in our way to get to the people we want to reach." 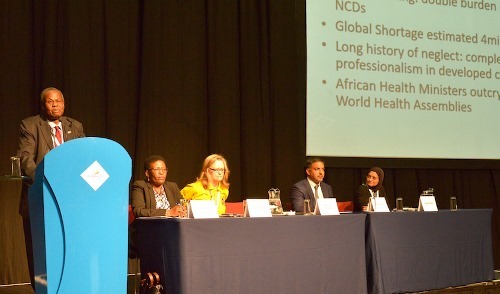 In the first Plenary, experts discussed the next frontiers in primary health care as a key pathway to achieving universal health coverage. "It's time to go to scale on primary health care," noted Dr Jean Kagubare from the Bill & Melinda Gates Foundation. Rwanda, where more than 90% of people are insured, has already shown that this is possible. At the Opening Ceremony, Africa Health 2019 co-chairs Hon Dr Diane Gashumba, Minister of Health of Rwanda, and Dr Githinji Gitahi, Global CEO of Amref Health Africa, welcomed conference attendees. "Access to health care should not be a lottery of where you are born and how wealthy your family is," noted Dr Gitahi in a compelling opening speech. The highlight of the Opening Ceremony was no doubt the cross-generational discussion led by Marie Claire Wangari, the representative from the Youth Pre-conference, who asked her elders to sit on the stage steps for an informal discussion among equals. AFREhealth cThe African Center for Global Health and Social Transformation (ACHEST), represented by the Director Health workforce Education and Development-Dr. Elsie Kiguli-Malwadde, who is also the secretary for AFREhealth , participated at the African Forum for Research and Education in Health (AFREHealth) Governing Council meeting that took place from the 18th to 19th February 2019 in Gaborone, Botswana. The meeting brought together members of the governing council of AFREHealth and other stakeholders to review progress on activities undertaken, successes, challenges and the way forward. 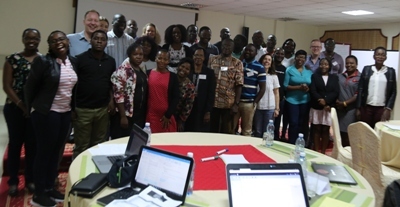 Health Systems Advocacy Partners at the Outcome Harvesting Training workshop in Nairobi“The Outcome Harvesting training is an effective initiative in achieving and maintaining project sustainability. The project team will not only apply the knowledge acquired to other projects but also to their day to day individual plans.” Dr. Patrick Kadama, the Director Health Systems at the African Centre for Global Health and Social Transformation (ACHEST) said while sharing his experience of the Outcome Harvesting training workshop. ACHEST was represented by a delegation of four staff from the Head quarters, one from Kenya, two from Tanzania and two from Malawi who joined the rest of the Health Systems Advocacy Partners; Amref Health Africa, Health Action International (HAI) and Wemos. The 4 days training workshop took place in Nairobi, Kenya from 18th -22nd February 2018; facilitated by the Netherlands based Partnership Desk. During the training, partner organizations and their sub-grantees learn how to harvest outcomes from their activities; conduct internal and external validation of their outcomes and later convert the outcomes into interesting human interest stories that can be shared with both internal and external stakeholders to influence decision making and practice. The Outcome Harvesting approach is a monitoring and evaluation framework that is best suited for the theory of change approach used by the Health Systems Advocacy Partnership project. The Health Systems Advocacy Partnership is a five year project whose implementation started in 2016 and ends in 2020 with funding from the Dutch Ministry of Foreign Affairs. The aim is to build capacity of indigenous CSOs to hold governments, private sector and other stakeholders accountable to deliver quality, accessible and equitable Sexual and Reproductive Health Services. Partners will therefore use the knowledge in the Outcome Harvesting training workshop to gather their contribution to the achievement of the overall project objective. They will also transfer the Outcome Harvesting knowledge to the other country partners. 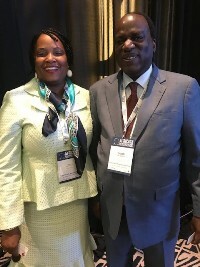 Dr. David Okello, Director of Non Communicable Diseases and Healthy Ageing at the African Dr. David Okello posing with Dr. Margaret Agama-Anyetei Head of Division Health Nutrition and Population Department AU Social Affairs1 Centre for Global Health and Social Transformation participated in the African Business Health Forum 2019 in Addis Ababa on the 12th February 2019to create strategic reach out for ACHEST and Africa Health Journal. Dr. Okello met a cross section of business practitioners and health managers from various levels; as well as Head of Division Health, Nutrition and Population at AU Department of Social Affairs, Regional Director/AFRO and her team, and representatives of the DG/WHO also attended the meeting. The meeting provided an excellent opportunity for strategic reach out to business experts and health leaders from different levels. At the meeting, African Business Coalition for Health (ABCHealth) was launched targeting private sector investments in health in Africa. ACHEST will reach out and strengthen ongoing arrangements to advance Africa’s health and wellness sector potential to create jobs using Africa Health journal, to publish articles which raise understanding and knowledge at policy level about business potentials in health in Africa and the contributions the Public Private Partnership can make. A key recommendation to follow through after the Forum is to develop and widely disseminateliterature to raise awareness about business opportunities in health promotion and wellness sector as the discussion at ABCHealth seems biased to opportunities on disease interventions and those related to the welfare of sick persons. This will be an avenue for advocacy and sharing of critical health information. on Thursday, 06 December 2018. The cold war was a period of extreme political tension between the Soviet Union with its satellite states and the United States with its allies. This tension was reflected in global multilateral agencies, including the World Health Organization. The end of the cold war transformed the dynamics of economic and health development at global, regional, and national levels. This political earthquake brought a seismic shift from international to global health. The cold war enabled corrupt governments and illegitimate military dictatorships to become the norm in the developing world. We witnessed gross mismanagement, human rights abuses, and economic collapse in sub-Saharan Africa. The United Nations and related institutions became ideological and diplomatic battlefields in which newly independent African, South American, and Asian states were used as pawns. Rogue beneficiaries traded their votes for patronage and money from either side. The end of the cold war in 1989 ushered in a new era of world politics and development in which health has played an ever increasing role. Two aspects are particularly important. Firstly, the principles of development assistance were transformed from being purely donor and ideologically driven to a more negotiated practice guided by pacts, such as the Paris Declaration on Aid Effectiveness and the Accra and Busan accords. These instruments promote country led, sector-wide approaches, which advocate for integrated and sustainable programmes, rather than standalone project implementation. African Centre for Global Health and Social Transformation (ACHEST) convened a half day DSCN9797 meeting for the Parliamentary Committee on Health titled; Achieving SDGs in Uganda through UHC: Implications for Parliamentarians on 6th November 2018 at Imperial Royale Hotel, Kampala Uganda. The objectives of the meeting were: Call for multisector action in Uganda; Gain a common vision on Universal Health Coverage (UHC); and Commit to integrated, people centered quality health services. A wide array of presentations were made including: An overview of UHC by Prof. Francis Omaswa: Implementing SDGs in Uganda by Dr. David Okello: Community Health Systems, presented by Dr Peter Eriki: Quality Assurance Health Services presented by Prof. Francis Omaswa; Health Workforce presented by Dr. Elsie Kiguli-Malwadde and: Financing SDGs and UHC presented by Dr. Patrick Kadama. Health should be a social contract between the government and the people. Prof. Omaswa stressed. on Wednesday, 03 October 2018. DSCN95612The African Centre for Global Health and Social Transformation (ACHEST) built the capacity of 55 members of Civil Society Organization (CSO) leaders together with Health Systems Advocacy partners (HSAP) (27 females, 28 males) from 31 organizations on Global Health Diplomacy. With funding from the Dutch Government, ACHEST organized and hosted the first Regional HSAP Workshop training on Global Health Diplomacy that ran from 18th to 20th September 2018 at Lake Victoria Resort, Entebbe Uganda. The Training brought CSO participants from five African countries; Zambia, Tanzania, Uganda, Malawi and Kenya who are actively contributing to the components of the HSAP project. 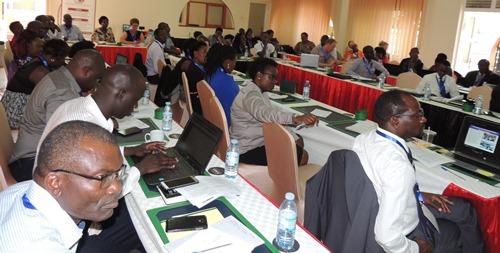 Some expert representatives from the UN Women, WHO-Country office, Prime Minister’s Office in Uganda, East African Secretariat, and Netherlands Embassy in Uganda, CEHURD and HSAP Coordinating Centre in the Netherlands participated and made presentations on topical issues at the workshop. The workshop provided an opportunity and space for participants to discuss selected issues in Global Health Diplomacy that specifically focused on SRHR, Health Work Force: Community Health Systems, Commercialization of health, Health promotion and Access to SRHR Commodities. Presentations and discussions were held on Global Trade and Health for developing countries and the WTO dynamics, (TRIPS), overview and lessons from Uganda Health Financing Facility for RMNCAH, country implementation for SDGs, Regional Progress in Domestication of Convention on Elimination of all forms of Violence and Discrimination against Women. The need for the training workshop was based on the fact that the field of global health is often thought of purely in medical or public health terms, but there are important geopolitical and policy dimensions of global health that underlie programmatic responses. Prof. Francis Omaswa giving a keynote speech at the symposium at Piato Restaurant in Kampala"The delivery of health services in Uganda is the responsibility of the local government. 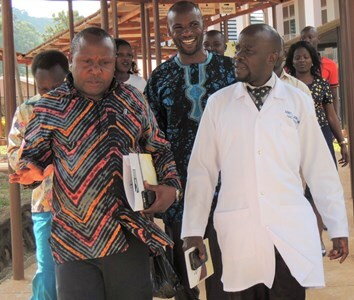 The ministry of health budgets and parliament approves; the money goes to the districts and it is the role of the local government to ensure that the community health systems initiative works." Prof. Francis Omaswa, the Executive Director of the African Centre for Global Health and Social Transformation (ACHEST) noted this while giving a key note speech at a half day meeting organized by Goal in partnership with ACHEST and HEPS. 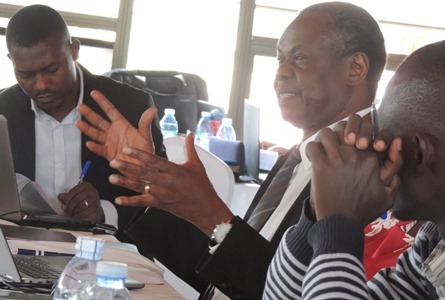 The aim of the meeting held on 29th August 2018 at Piato Restaurant in Kampala was to consolidate stakeholder feedback on the draft framework for action from the symposium on the successes of community participation in improving health worker performance. Primary health care is essential health care based on practical, scientifically sound and socially acceptable methods and technology made universally accessible to individuals and families in the community through their full participation and at a cost that the community and country can afford to maintain at every stage. Vincent Mujuni, the Deputy Programme Director Accountability Can Transform Health Programme (ACT Health) pointed while presenting the draft framework. Dr. Patrick Kadama, the Director Policy and Practice at ACHEST while making a submission advised that having village registration, a system of people recognition will help the community health workers know who they are serving and who they are accountable to, that way, the health worker performance improvement and community participation will gain a lot of traction. Dunstan Balaba, the Chief Adminstrative Officer of Tororo district warned that Accountability through Community barazas’ should be to both the people and the government. Attendance to duty alone is not enough, but delivery of quality service is what the people need. Dr. Enid Mbabazi, a Coordinator at the Office of the Prime Minister (OPM) while closing the meeting informed the meeting that OPM is conducting stakeholder identification in a bid to form a Think Tank Lab where institution representatives will come together to find practical solutions for improving health workforce performance through a multi-sectoral approach. Dr. Richard Mugalu, the District Health Officer (DHO) and the Deputy President of the DHOs noted that the issue of a muti-sectoral approach looks easy in boardrooms, yet it is one of Uganda’s problems and if not perceived well, there is fear that this will be misconstrued and implemented in silos by different sectors that are at different levels. The meeting will incorporate feedback received into a finalized petition and present to the Chairman of the Parliamentary Forum on Quality of Health Service Delivery for presentation on the floor of parliament. Dr. Elsie Kiguli-Malwadde, Director of Education and Health Workforce Development at the African Centre for Global Health and Social Transformation (ACHEST) who is the Secretary General of the Network Towards Unity for Health (TUFH) represented ACHEST at the Annual TUFH conference which took place at the University of Limerick, Ireland from 15-20th August 2018. Dr. Elsie Kiguli-Malwade of ACHEST Right speaking at the TUFH conference in IrelandThe theme of the conference was; “Community Empowerment for Health: A Multi-Sectoral Approach.”During TUFH 2018 Conference, participants discussed empowerment of underrepresented sectors and communities, intersectoral opportunities, and the ways educational institutions can be encouraged to become more socially accountable. Presenters’ demystified empowerment as listening and shared decision-making with emphasis laid on communication and partnership, without which empowerment cannot be possible. The conference was based on four Subthemes that included; 1) Empowering Communities 2) Empowering Under represented Sectors in Society 3) Intersectoral Opportunities and Challenges and 4) Engaging Educational Institutions. Dr. Kiguli-Malwadde who was part of the organizing committee of the conference moderated several sessions and spoke at the opening and closing ceremonies. 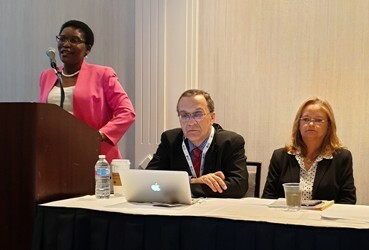 She also presented a workshop on Empowering Women in health workforce leadership and was a panelist at the TUFH talks, 3 minutes presentations by participants (like TED talks) that was followed by questions from a panel and later the audience. The African Centre for Global Health and Social Transformation (ACHEST) sent a delegation of four people that included; Prof. Francis Omaswa, the Executive Director and three directors that included; Dr. Patrick Kadama, Dr. Elsie Kiguli-Malwadde, and Mr. Robert Odedo, to participate at the 2nd Annual African Forum for Research and Education in Health (AFREhealth) Symposium. 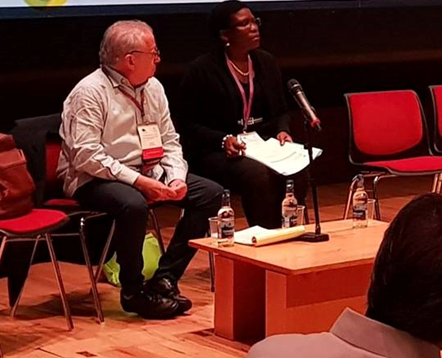 Prof. Francis Omaswa chairing a session at the 2018 AFREhealth Symposium in DurbanThe Symposium was held at Durban, KwaZulu-Natal, South Africa from August 06 - 08, 2018. The African Forum for Research and Education in Health (AFREhealth) is an interdisciplinary health professional initiative, which seeks to improve health care in Africa through research, education and capacity building. AFREhealth is an initiative that was launched during the MEPI/NEPI (Medical/Nursing Education Partnership Initiative) symposium in Nairobi in August 2016. AFREhealth aims to drive transformation in medical education, policy and health professionalism that is relevant to Africa, by Africans for Africans. The symposium with the theme: Towards Achieving Universal Health Coverage in Africa - Creating Synergies and Capacity through Education, Research and Quality Health Services brought together 350 people from 20 countries around the globe. 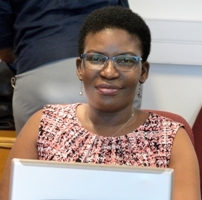 University of KwaZulu-Natal Developing Research Innovation, Localization and Leadership in South Africa (UKZN DRILL) hosted the Symposium in collaboration with the African Forum for Research and Education in Health (AFREhealth). The Sub-themes of the symposium included; 1) Training the Health Professions for Universal Health Coverage 2) Building Research Capacity in Africa 3) Achieving the SDGs and the 90-90-90 targets for HIV/AIDS 4) Financing health care in Africa and 5) North-South & South-South partnerships for health system development. ACHEST convened a workshop on Migration of Health Worker force with specific interest on the Implementation of the Global Code on Migration of Health Workforce where Dr. Patrick Kadama, Mr Robert Odedo, Dr. Elsie Kiguli-Malwadde and Dr. Ibadat Dhillon made presentations on the Case Studies from Uganda and Nigeria chaired by Prof. Francis Omaswa. The development partners including PEPFAR and HARSA communicated their decision to direct 70% of their grants to African indigenous NGOs; these will be organizations with roots and headquarters in African countries. 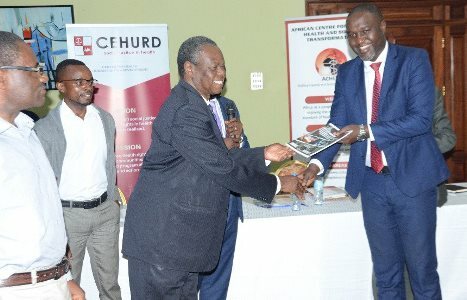 ACHEST disseminated Information Education and Communication material at the conference that included; “Strong Ministries for Strong Health Systems” handbook and African Health Leaders handbook. A collaboration program between ACHEST and the Tropical Institute of Community Health was hatched during the meeting. DkoiZ3sX0AApXSw1frican Centre for Global Health and Social Transformation (ACHEST) in partnership with Center for Health, Human Rights and Development organized a dissemination meeting on 15th August 2018 at Imperial Royale Hotel to disseminate findings of an exploratory study titled, "Business Unusual?-Conceptualization and Implementation of the World Bank Global Financing Facility (GFF) in Uganda." A study conducted by CEHURD, the chair of the Reproductive Maternal Neonatal Child and Adolescent Health (RMNCAH) Coalition that ACHEST supports highlighted some of the challenges with the current design of GFF which includes among others; Results Based Financing requires a strong Health System and technical capacity on the part of service providers which are not in place. The selection criteria for the beneficiary facilities based on the RBF concept of good performance could further undermine the poorly performing facilities and limited involvement of CSOs could undermine the monitoring of GFF performance implementation. The objective of the meeting was to share the final report, discuss recommendations and strategies for addressing the capacity needs, gaps as well as opportunities for engagement in the implementation, monitoring and evaluation of the GFF project in Uganda following the approval of Uganda's investment case by the World Bank. on Monday, 13 August 2018. As part of the advocacy strategy under the Health Systems Advocacy Partnership; African Centre Mubende 4 for Global Health and Social Transformation (ACHEST), Amref Health Africa and Health Action International (HAI) represented by Coalition for Health Promotion and Social Development (HEPS) organized a fact finding visit for representatives of the Parliamentary Forum on Quality of Health Care Services. (1): To follow up on health worker absenteeism in an earlier research finding; (2): to ascertain stock levels for SRH commodities in the selected facilities; (3): to find out governance issues affecting the delivery of quality health care service; (4): and to assess the working conditions of health workers and its impact on quality of health service care provided. The field visit followed a petition by a group of CSOs to the speaker of Parliament on the status of health care services that was tabled on May17th 2018. The HSAP partners in Uganda therefore found it appropriate to support the legislators to carry out targeted visits to four sampled districts in the Central, Northern and Eastern regions and in the districts of; Bukedea, Lira, Mubende and Mityana.